Welcome to Salem, the capital of the state of Oregon and county seat of Marion County. It lies in the center of the fertile Willamette Valley, one of the most productive agricultural regions in the world. "Salem" is derived from the Hebrew word "Shalom", which means peace. This a big city, with a small town feel and attitude. There are about 138,000 residents and is the 3rd largest city in Oregon. The Capital building is the 3rd one in Salem. The first two burned down. The current building dates to the 1930's. It is a striking capital building that is a favorite destination for visitors. Even though it was built in 1938, it has a modern look and feel. It is constructed mainly of Vermont marble, with a cylindrical tower topped by a burly gold-plated pioneer. Large marble sculptures are on each side of the main entrance - Covered Wagons on one side and Lewis and Clark by Sacagawea on the other. On the backs of the statues are maps of the route of Lewis and Clark, and the Oregon Trail. Inside the rotunda in the marble halls are paintings, murals and sculptures depicting important events in Oregon's history. 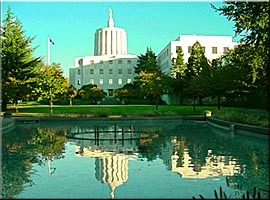 There are guided tours for those who wish to learn more about the capital and Oregon. Salem is also known as the Cherry City. One must visit Salem in late March when all the Cherry Trees are in full bloom! The city's focus is primarily governmental, but it serves as a hub for the farming communities and is one of the largest centers of food processing in the nation. It lies along the I-5 corridor and is within an hour's drive of Portland. In a bid to diversify its economic base, Salem attracted a number of computer-related manufacturing plants in the 1990s. In November, 2003, the Sumitomo Mitsubishi Silicon Group, one of these arrivals, announced that they will close their two silicon wafer plants at the end of 2004, eliminating 620 jobs, and moving the production to other plants. The Pioneer Man stands proudly on top of the capital building as seen below. Oregon's original capital was Oregon City. The capital was moved to Salem in 1851, then to Corvallis in 1855, and then finally back to Salem later in 1855. The Native American name for the area was Chemeketa, which means "meeting or resting place." The first white settlement in the area was the Jason Lee Mission in 1840. The missionaries established the Oregon Institute in 1842 in the area that was to become the first townsite of Salem. In 1844 the mission was dissolved and the townsite established. It is uncertain who chose the name for the town, but it is believed to be one of two people: Trustee David Leslie from Salem, Massachusetts, or W. H. Willson who in 1850-1851 filed the plans for the main part of the city. The name "Chemeketa" is preserved as the name of the local community college, Chemeketa Community College. Other Attractions in the Salem area is the Mission Mill Village. This is reconstructed woolen mill that has been turned into a living history museum. Tours are led by guides in period costumes. The park, which covers 5 acres, has several historic pioneer houses, a woolen mill built in 1896, a water powered turbine that converts fleece into wool fabric, a machine shop, and the Marion County Museum of History, as well as village shops, and a cafe. Those who wish to take a picnic lunch can enjoy eating on the banks of the mill stream. Bush's Pasture Park in downtown Salem is one of Salem's finest parks. In the park is the Bush House Museum, an Italianate Victorian house completed in 1878. The house contains many original furnishings, Italian marble fireplaces and a beautiful walnut and mahogany staircase. House tours are available. The Bush Barn Art Center is also in the park. The art center has two galleries featuring works of local artists, including paintings, prints, ceramics, woodworks, basketry, jewelry and cards. Don't forget to take a stroll through the Bush Conservatory greenhouse and rose gardens. Hiking around and behind the ten waterfalls at Silver Creek Canyon in Silver Falls State Park is a good day trip. The lush greenery and the silvery cataracts of the falls are an incomparable sight, and a good place to picnic on a hot day. Visit Cooley's Gardens or Schreiner's Iris Gardens to see the spectacular sight of acres and acres of irises blooming in the spring. This is a favorite destination for visitors in May. The easy pace of the city makes Salem a place to come and relax. The variety of things to do will make it a favorite destination for the whole family.